My mother was born in a small village near the city of Wuhan in the province of Hubei, China in 1958. She was born as Wenying Wang. Being the only girl in a family of five, she dropped out of middle school to care for her brothers despite my mother showing a promising academic future. This was not uncommon for someone in her economic and social standing. In the midst of caring for her brothers, maintaining the household, and helping her mother with her many business ventures, my mother met my father, Xiongbing Xia. My parents fell in love but were apart for most of their early relationship. My father was one of the lucky few who scored high enough in the college entrance exams to continue his education at Wuhan University. Coming also from a poor rural background, my father lacked the monetary means to pursue his dream so my mother set out to work in a factory far from the town that she grew up in to support my father. After completing his undergraduate degree, Xiongbing Xia and Wenying Wang were married on August 1, 1982. Immediately after, my father started his masters at an University in Nanzhou. My mother continued working to support him while carrying me. I was born in 1983 and in 1985 my father left for America to pursue his PhD at the University of Idaho. Realizing that America promised a better future, my mother made difficult decision and left me behind to establish a home in America with my father. Their hope was to save enough to support a family. In 1987, I came to America. I do not remember that much from my early childhood but I do recall my mother’s love for me and for her family. We spent many hours collecting cans and bottles that were discarded by people in the neighborhood. The cans and bottles were recycled for money. It was a game for me-trying to collect more coke cans than beer cans-but a means of income for my mother. When my brother, Carol, arrived in 1989, the pressure on my mother increased. She worked in multiple restaurants and even a chocolate shop to earn money. She would save every morsel of chocolate they gave her to bring home to me. In 1992, my father decided to pursue a post-doctorate at the University of Florida. Once again the family packed up in hopes of “making it” in America. Here my mother worked in several customer service areas: cleaning rooms in hotels, dishwashing in restaurants. With the birth of Marilyn in 1993, our whole family chose English names. My poor brother who had had a feminine name since birth was at long last given a boy name, George. My parents decided to become Michael and Rachel Xia. I was old enough to pick my own name and settled on Christina. Until this point, my father had been on a working visa, with my mother on a family visa. Their stay in America depended on the support of my father’s Employer, the University. That year was a rather busy year to secure green cards. My parents were always talking about it. Every conversation with anyone involved these “green cards.” Even after obtaining the coveted cards, our financial situation remained precarious. We were a family of 5 being supported by my dad’s post-doctoral salary supplemented by my mom’s multiple minimum wage jobs. 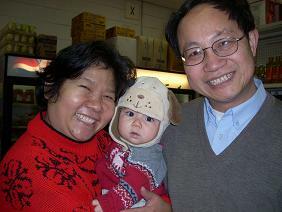 Once again, our parents had to make a very difficult decision; they sent Mary to live in China so that daycare would not deplete their income. With his post-doctorate position leading nowhere, in 1994 my father left for Delaware, with the goal that he would find work in a pharmaceutical booming state. Unbeknownst by my brother and I, this would be our last resort in trying to stay in America. If work could not be found, we would all return to China. They had spent almost 10 years living day by day with no promise that things would change. With half the income gone, my mother fed us on food stamps and her meager savings. Despite all of our cut-backs since we had arrived in America, I had never felt poor. We didn’t go out to eat but my mother was known for her wonderful cooking and I didn’t feel that we were missing out. Buying clothes at yard sales was like a treasure hunt. You never knew what type of toys you would find. And when perfectly good furniture got thrown out by the local college students, we made sure they went to a good home. I had only known apartment living and thought it was strange that some of my classmates lived in apartments that had more rooms and they didn’t have to share with anyone else. We didn’t have land but to save money on groceries, my parents had rented a small plot of land to plant vegetables. We ate most of the harvest but any extras were sold to the near-by Asian Grocery store. Looking back maybe being friends with the store owner had inspired my mom to one day open her own store. After two months in Delaware, my father secured his first job outside of the college setting. He was hired as an Organic Chemist in the pharmaceutical branch of DuPont. We were so excited. Once we rejoined my father in Delaware, my parents started looking into starting their own business. After always having their livelihood depend on others, my parents wanted to take the future into their own hands. Plus, the job that my dad obtained had been a contract position and the contract would be over in a year. My mother surveyed the local restaurants and stores tirelessly. They soon realized that the only Chinese grocery store was in Wilmington. A large amount of time went into product and demographic research. Where should they be located? What types of foods should they sell? Do they only sell non-perishables and frozen items? Where do they get everything? There were so many things to look into. Finally, they decided that by placing the store in Market East Plaza on Main Street it would be most convenient to the local college students, their target demographic at the time. When Jamesway went out of business, while everyone was buying discounted items, my parents were buying the shelves, refrigerators and business related supplies. Finally after months of deliberation and planning, Wang’s Oriental Food Store opened on August 8th, 1996. This date was chosen specifically for it’s lucky numbers. In Chinese, the number eight is pronounced “ba” which is very similar to “fa,” prosperity and wealth, so in China, the number eight is associated with wealth. That day, the whole family worked at the store. I wore a bright yellow dress and ran the cash register. I had been practicing ringing up orders leading up to the grand opening. It was the busiest and most exciting day of all our lives. I remember not eating lunch until mid way through the afternoon. But we still didn’t know if the store would prosper. Even after multiple setbacks it was evident that the store was not losing money. In fact, it was making money. Almost simultaneously my mother had a friend bring my little sister back from China. Finally our family was whole again. Our whole family put everything into the store. As soon as I got out of school, the bus dropped me off on Main Street so I could work. Around closing time, mom made dinner on the small stove in the back. This would fill the entire store with the aroma of her delicious foods. That was definitely good for business. In those early days, our store was small enough so that food could be transported from Philadelphia via our family van, a red Mazda MPV. My mom worked there 7 days a week and 10-12 hours a day. For four years that’s how it went. She never complained. With business doing well, we outgrew the rental space and soon moved to a larger lot in the back of Market East Plaza. We even bought the house that we were renting at the time. Our first house in Stafford. In 1999, after months of studying and memorizing facts, my mother became a citizen of the United States of America. For her this was one of her proudest moments. For a woman who’s verbal skills were at the basic level, passing the citizenship test was an extraordinary feat. But her past had taught her that with hard work and endurance she would prevail. In late summer of 2000, my mother went on a hunch to go see a doctor. She was starting to feel weakness in one of her arms and found that there was a lump on her chest. If you know my mother, you would know that she hates doctors; she doesn’t trust them and thinks that everything can be solved with some traditional Chinese herbal drink. Swallowing her pride she sought the diagnosis of a professional. Her fears were confirmed: She had breast cancer that had spread to her lymph nodes. After surgery she underwent chemotherapy. The treatment tested her will to live. I had never seen the foundation of our family so frail and tired. Our family struggled. My father hired a manager to run the store. My mother, who had previously spent everyday at the store was devastated that the cancer had left her weak and dependent on those around her. At her lowest point, my parents put my mom’s beloved store on the market. But before closing could occur, they realized that mom needed the store to give her strength, to help her reclaim her independence. It’s been almost 16 years since her chemotherapy and my mother’s cancer has been in remission. After surviving through that ordeal, I believe she finally knows how strong she is. My mother has overcome all odds to earn her role as a successful business woman. Her most important role and the one that has always been the driving force behind her working and earning money has always been…her family. She wears herself out day in and day out for my father, my brother, my sister and of course, myself. It is only now, having become a mother myself, can I begin to realize the love a mother has for her children and the love that Wenying Wang has for us. Update: My mother loves her family dearly. Her family includes not only the 5 of us but her brothers; she has 1 older brother and 3 younger brothers. In 2011, based off of sibling immigration which took ~10 years, all 4 brothers and their families were able to come to the US. I have 3 aunts and 1 uncle who work full-time at the store. I hope my mom realizes how her hard work has put her 3 children through college and continues to support her family.